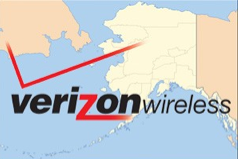 The long wait is over, Verizon is coming to Alaska! It was the only remaining state without Verizon data. The company announced it is about to light up its 4G LTE network in the more urban parts of the state and begins taking customers for data transmission Friday. Verizon cellphone customers are expected to see cell phone improvement too, because up until now the company has been renting capacity from other carriers. The company claims its 4G capacity will be much faster than what is now being offered and they will have generators located at the towers in case of power failures.